This month Glossybox has brought over a few French treats, to sample the ever so popular French pharmacy ranges. 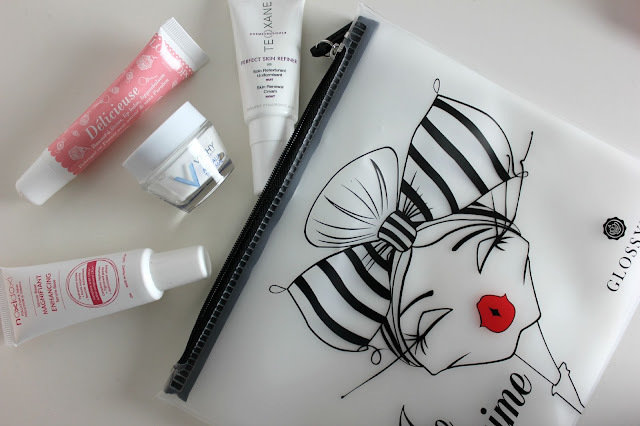 French skincare is always extremely popular over here and of course any French pharmacy box is going to cause a stir. The box itself is beautiful with fantastic illustrations of famous landmarks around France to cute little cafe's and chateau's. 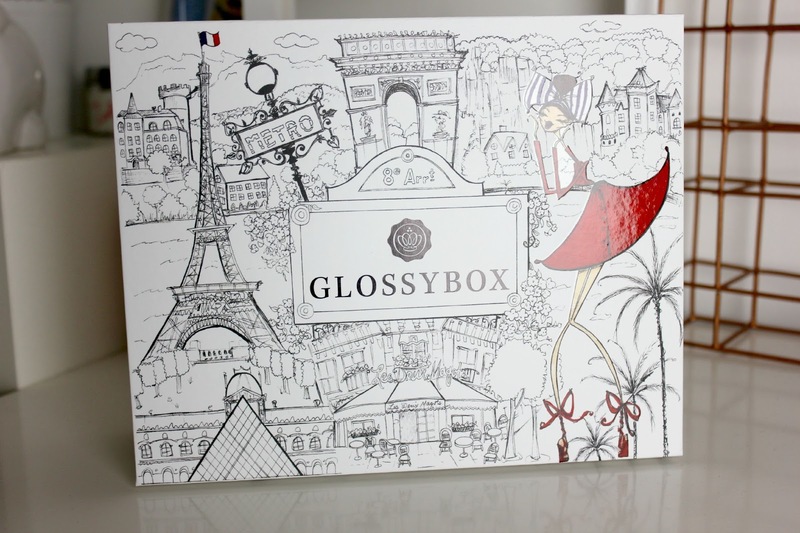 As well as a illustration of Mademoiselle Glossy, who is the face of the pick's in this months box. 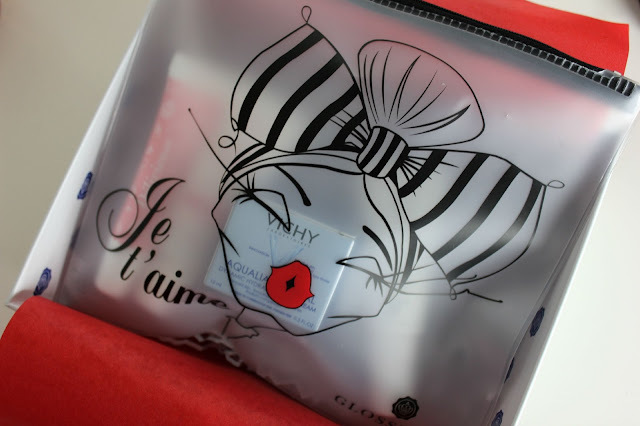 The packaging includes a beautiful little travel pouch that holds the products, as well as the traditional Glossybox shredded paper and wrapping paper too. The pouch has been made so that it can also be used for travelling as its the perfect size to hold everything while travelling on a plane. But at the same time it is also the perfect little sized pouch to hold everyday items in your bag to keep everything together. Vichy is always a popular brand in the blogger universe, having dry skin a hydrating cream like this one is always welcomed. Its very lightweight which is surprising as a lot of hydrating products are a lot thicker in consistency. I love the smell, it reminds me of baby powder. Its hydrating on the skin, but as its so light it feels very gentle too, I think its a great one for the Summer. I've never heard of this brand before and the idea of the product intrigues me, as its been designed to protect the skin from environmental factors, mainly being smoke from cigarettes. Which I think a lot of the time you think London is going to be the big city for environmental factors and it just shows its a useful thing to be using everywhere. The consistency itself is quite runny and feels very lightweight, but it has a lovely almost clean smell to it, which doesn't come across too offensive. I was actually really surprised by this product, I thought it was going to be tinted, but instead it seems to come out of the tube resembling vaseline. However it melts into the lips more like an oil and far from the consistency of vaseline. Its got quite a sweet smell to it and seems quite hydrating on the lips. This is another brand that I haven't heard of before, at first glance it does come across as almost quite a clinically based brand. But the product itself is right up my street, it has a key ingredient of hyaluronic acid, which helps to hydrate the skin. But it also seems to include glycolic acid too, so it helps to remove the dead skin cells too, which is always helpful with dry skin. However the price isn't so much my favourite thing in the world, but I'm looking forward to giving it a good try.